ATCGbio Life Technology Inc. provides pSLIC-GfpP2A lentivirus plasmid construction kit (LT2003) to let user creates the lentivirus plasmid for the gene of interest. This kit comes with SLIC enzyme and a lentivirus plasmid which contains GFP expression sequence and P2A sequence. SLIC (sequence and ligation independent cloning) allows users to insert PCR product into the plasmid without ligation. P2A peptide sequence allows to express both GFP gene and user’s gene of interest by a single CMV promoter (bicistronic). P2A sequence in our plasmid is GSGATNFSLLKQAGDVEENPG/PD. The first part (before slash "/ ") GSGATNFSLLKQAGDVEENPG is attached to GFP and the second part (after slash "/ ") PD is attached to the gene of interest users insert. Our proprietary SLIC enzyme system which has superb performance and temperature stability (stable even at room temperature for a few days). In 30min reaction with SLIC enzyme, PCR product is inserted downstream of P2A sequence. This kit is suitable to make lentivirus for primary cells in which antibiotic selection is difficult to perform but monitoring expression rate is important. In most of the cells it takes 1-3 days to express GFP and target proteins. Because of bicistronic expression, GFP positive cells are also positive for a gene of interest expression. Kit components: shipped at room temperature, and stored at following temperature. 4°C.This plasmid is not intended to amplify. ATCGbio Life Technology Inc. provides pSLIC-GfpP2A lentivirus construction kit (LT2003) to let user creates the lentivirus plasmid for the gene of interest. This kit comes with SLIC enzyme and a lentivirus plasmid which contain GFP gene and P2A sequence. SLIC (sequence and ligation independent cloning) allows users to insert PCR product into the plasmid without ligation. This technique has been developed last 10 years (for example, see Nature Methods 4:251-256, 2007) and we created our proprietary SLIC enzyme system which has superb performance and temperature stability (stable even at room temperature for a few days). P2A peptide sequence allows to express both GFP and user’s gene of interest by a single CMV promoter (bicistronic). To make the ligation effective, a staffer sequence was inserted between EcoR V. User first digests the plasmid with EcoR V and then inserts the PCR product by SLIC enzyme reaction. User performs PCR (gene of insert) with primers having 15bp homologous to the ends of EcoR V sequence. In 30 min reaction with SLIC enzyme, PCR product is inserted downstream of P2A sequence. P2A-like peptide sequence was discovered in various virus genomes and found to self-cleave near the end of sequence during translation. P2A sequence in our plasmid is GSGATNFSLLKQAGDVEENPG/PD. The first part (before slash ”/”) GSGATNFSLLKQAGDVEENPG is attached to GFP gene product and the second part (after slash "/") PD is attached to the gene of interest users insert. Start codon of gene of interest (ATG) may be removed. Alternatively, user can put flag-tag (DYKDDDDK) sequence at the N-terminus gene of interest just by a single PCR as shown in this manual. 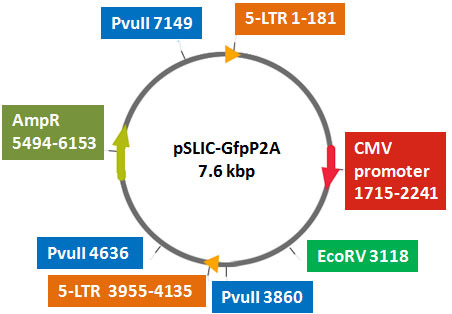 Our pSLICs plasmids backbone structure size is 6.8Kb plasmid having 3.4 kB basic lentivirus components between 2 LTRs. Original 5’ LTR promoter activity will be self-inactivated during virus production. pSLIC-GfpP2A has GFP + P2A sequence (total ~0.8 kB) followed by a staffer sequence flanked by EcoRV site. Gene of interest should be subcloned by PCR by primers containing 15bp homologous to end of EcoR V digestion site (see above figure). Red colored sequences need to be incorporated into PCR product. The PCR product should be gel-purified. By SLIC enzyme reaction, PCR fragments can be inserted to pSLIC-GfpP2A plasmid in 30 minute. For more details, please read the User Manual.